I recently received this book through my library. I have checked it out before but was not able to fully dissect it. The first time was just a glance. This second time is more in depth. When I first get a book such as this, casually flip through it. I don’t read it but will flip through it several times over a couple of days. This is especially helpful if the book is in a format or on a subject that I am unfamiliar with. First let me tell you what this book is not. It is not a book on teaching art. It is not an artists study curriculum. It is not written about studying art/artist in your home school. The premise of the book is based on the idea of you the reader wanting to take your child(ren) to an art museum and how that should be gone about. Let’s talk table of contents. First of course is the introduction. The first section is entitled “A Good Start” and includes these subsection: developing an interest in paintings, tips for successful visits, what to show them depending on their age, 5-7 year olds, 8-10 years, and 11-13 year olds. The second section is titled “It’s OK not to know” and includes these subsections: paintings and museums, painters, painting in the twentieth century, religious art, portraits, mythology/history/allegory, landscapes, scenes from everyday life and paintings of objects, and the price of a painting. 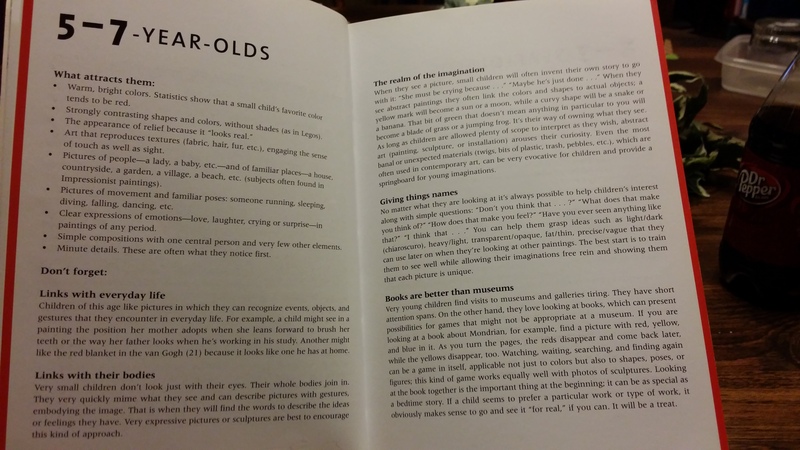 The third section is titled “How to look at a picture” and includes 30 pictures broken down by age. I will include a picture when I get to this section. Let’s start with the introduction. The author states “The aim of this book is to help provide people who enjoy paintings but don’t know how to look at them share that enjoyment and talk about it with their children”. Ms. Barbe-Gall then continues with the idea being to provide a few pointers and the book is NOT a textbook. This sentence caught my attention and told me to give the book a thorough study before dismissing it. (Or did I?) It states, ” Instead of being presented with a lot of theoretical information on the period, the context, the artist, the subject, and so on, the reader sees the picture itself first.” That is what we do using Charlotte Mason’s artists study. Yes we learn about the artist but we study the picture first. We make connections by observing the painting. We do this regularly and learn the artist through his/her paintings over 4-6 weeks. I think the author and I can come to an agree. The author also states that this approach works well with children because the paintings are the most important thing. She finishes her introduction by summing up the purpose of the book. I flipped through this section several times, going back and forth, picking at a few things to read. Finally I decided enough. I started at the beginning and am very glad that I did. The first subsection is “Developing an interest in paintings”. The author begins by telling us that it doesn’t take much to kindle a love for art but it also doesn’t take much to extinguish it either. Topics in this section are: get rid of old habits, think back to your own experiences, simply express what you feel, something that stays with you, hold yourself back, let the child choose, and start where the child wants to start. This section basically states that we should begin the visit by imposing our impressions onto the child right at the start. We should let the child lead by noticing what they are drawn to and going from their. For example, we might be drawn to a certain type of painting that to us looks interesting but to a child might not capture them where as they might be drawn to a picture with lots of color and everyday objects. (Remember we are talking about museum visits not our curriculum!) The next subsection is “Tips for Successful Visits”. 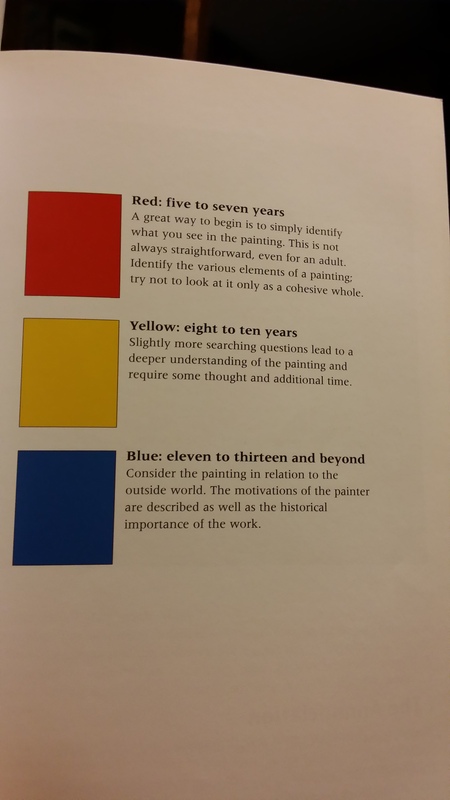 This I found to be a good section in general and could probably be applied to any museum. It includes: forget the rainy day visits, choose somewhere that’s not too far away, don’t stay too long (or don’t try to see everything), explain the rules, put yourself in your child’s place (and height), use the maps and read the notes, don’t hesitate to go back to the same works, and buy some postcards at the end of the visit. All these sound like common sense but it does not hurt to reiterate or delve into a bit more. Let’s talk about the first three. The ones that we know but don’t always keep in mind. The rainy day visits have nothing to do with weather but with regulating art museum visits to something akin to a last resort activity. Visit in good weather and bad weather. Make the trip special each and every time no matter the weather. Though going on a bright day sure brings the painting to light better than on a dreary grey day. Then we have the not too far away and the don’t stay too long. Now, we all know this but it is really hard not to do either or both of them especially when you have to make special trips somewhere that is more than an hour away. We want to get our money and time’s worth out of the visit. My husband and I are discussing (okay I’m trying to get my way and he’s trying to understand) on getting a membership to a museum. We have several local artist type here and live 45 minutes away from several smaller ones. But the larger ones are two hours away in Atlanta such as the High Museum. Because of the drive (I did mention two hours right) and the expense (4 of us without hubby and 6 if we all go plus Nana), I think it would be beneficial to buy a membership. Then we could maybe 4-5 times a year and/or to special exhibits. That way we are not spending all day walking around and looking at paintings. Even I would probably be bust by the time 2 hours was up. I this is very doable. The problem being the price up front but still cheaper than 4-5 individual visits with money needed each time. Anyway, let’s me on. Explain the rules is something to be done no matter where you visit. However, it is often hard especially for the younger kids to understand the no pictures and touching rules. My seven year old is very touchy feely with things so this is always a big issue. Tip from me. Practice this at home. Make your own art display with their drawings or if you have boys their lego creations. Practice several days about the no touch rule. It helps.Put yourself in your child’s place or at their height is one that I don’t usually think of. The author states, “In galleries, paintings are hung to be viewed by adults. If you get down to your child’s height, you will realize children can’t see exactly the same things as you”. That is a right in your face reminder don’t ya think? She then says it might explain why a child is interested in a detail that might be secondary to us. The last three are self explanatory. Maps are a must in a large gallery and the notes at any museum help us to understand what we are viewing. The author points out that older children might be interested in how a room is laid our such as chronological order or by subject. We never can leave some where without a token. We buy postcards for our scrapbooks and occasionally a book about the place or something interesting. As the author points out, postcards make good bookmarks, wall hangings, and are portable. The next subsection and the following three all have to do with what to show them depending on their age. I have a pic for you. Here is what the author has to say about this section. “There is no point in setting limits on what to show children. Any picture has the power to speak to a child. The following are suggestions aimed to clarify a few points. They are a reminder of the kinds of things that generally hold children’s attention, but should in no way be interpreted as definitive.” The author has broken it down into three age groups: 5-7. 8-10, and 11-13.As you can see from the first pic above, she has color coded them. Let’s use the 5-7 year old section as our walk through section. First is “what attracts them” which for this age group would include warm, bright colors, strongly contrasting shapes and colors (think legos the author says),art that represents texture such as hair or fur, pictures that represent familiar everyday things or movement. That is just a few of things that attract them. Next we have a don’t forget section that includes links to everyday life (things they can recognize), links with their bodies (they don’t look with just their eyes but with their whole body), the realm of imagination, giving things names, and books are better than museums. Wait, wait, wait! What was that last statement you say. Books are better than museums,says the author,for very young children. Books represent opportunities for games (especially ones not appropriate in a museum setting) and does not need long and tiring visits to a museum. Books allow for everyday visits. I assume she is talking about those younger than 5 since that is the age her section starts. For those home schooling, especially using Ms. Mason’s artist studies, we would eventually long to see these in a museum setting. I got a lot from this section. I have three kids 7, 15,17 and sometimes it is hard to transition from talking with my older two to talking with my 7 year old. My adult mind sometimes doesn’t make the leap. Frustrations often arise when all is involved. That was alot to take in and it was only the first section. Whew! I will be doing three parts in my review of the book. The next post will be one section two, “It’s okay NOT to know”. The third post will be section three, “How to look at a picture”. This post will not be on each picture but more of a general how do I plan to incorporate the suggestions into our regular artists study. This has been a struggle for us so I look forward to this section. See ya on the next installment! !